In 1922, Bob's grandfather C.R. 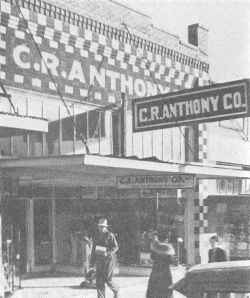 Anthony opened his first family clothing store in Cushing, Oklahoma. Upon Mr. C.R. 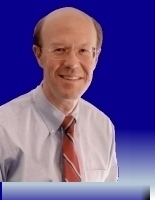 's retirement in 1972, Bob's father Guy Anthony became president of the company and served in that capacity for eight years. The Anthony store in downtown Drumright in 1937. Bob and his five brothers grew up with the Anthony Company -- working in the mail room, visiting stores, learning the family business. Bob began his retail career sweeping floors. When he was sixteen years old, he was promoted to sales clerk and was allowed to wait on customers at the Reding Shopping Center store in South Oklahoma City. In 1980, at the age of 32, Bob Anthony succeeded his grandfather and father to become the third president of the C.R. Anthony Company. 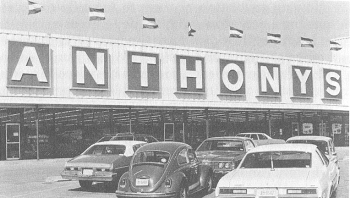 During his seven years as president and chairman of the executive committee, Anthonys had as many as 300 stores in 20 states, and sales for the retail chain increased from $256 million to $411 million. Also during Bob's tenure as president, sales, payroll, employment, and dollar profits reached all-time record levels, and the company was listed as the largest privately-owned firm headquartered in Oklahoma. In 1986, Bob accepted the "Five Who Care" Corporate Humanitarian Award on behalf of the C.R. Anthony Company -- only the third corporation to be so honored. The award recognized Anthonys' contributions to a variety of charitable organizations as well as the company's employees and their involvement as volunteers in their respective communities across Oklahoma. The 30,000 square-foot Economy Square store in southwest Oklahoma City in the 1970s. In 1987, the shareholders voted to sell the C.R. Anthony Company to an investor group sponsored by Citicorp Venture Capital. The $112 million transaction marked the largest venture capital investment in Oklahoma for more than a decade, and the value of the Anthony Company employee retirement trusts increased substantially. The following year, Bob launched his first of five victorious statewide political campaigns and was elected to the Oklahoma Corporation Commission. In 1997, Houston-based Stage Stores, Inc. bought the C.R. Anthony Company and changed the name on the stores from "Anthonys" to "Stage." As of 2018, there were still about 35 Stage stores operating in Oklahoma, most in old Anthonys locations. 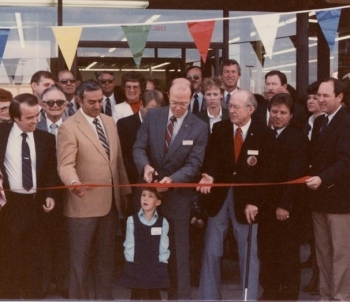 Three generations of Anthonys -- Bob (center), his father Guy (with cane) and third daughter (under the ribbon) -- celebrate the grand opening of a new C.R. Anthony Store in Amarillo in 1984. Return to Bob's Track Record.